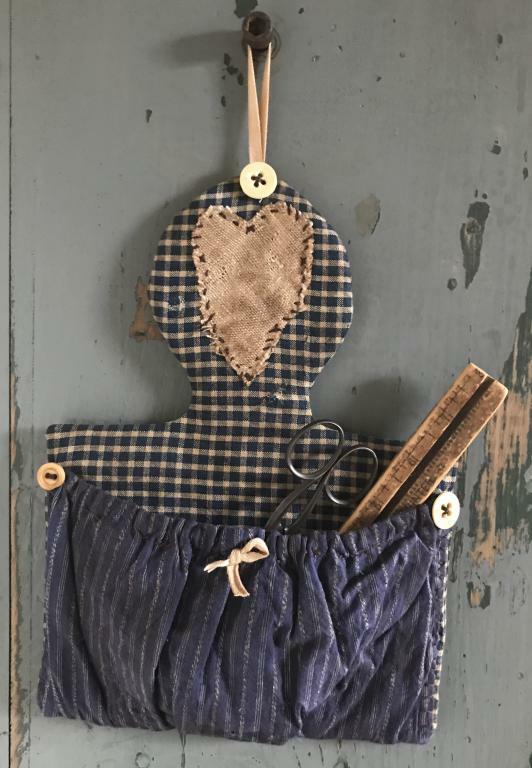 A wonderful primitive piece ready to hang on a wall or from a peg to hold anything from envelopes to sewing tools to combs. A perfect primitive addition to any room. The fabrics are aged nicely with modest amounts of stressing and over dyeing to give it that vintage look. There are three vintage buttons, two wood and one painted china as well as aged twill tape for hanging. The appliqué heart cut from an old feedsack and is primly hand stitched in place. The gathered pocket is primly hand stitched in place with a button at each corner. The back is covered with repro homespun fabric and slightly padded with wool batting.The overall measurement is 10 1/2 x 7 1/2”. The pocket is 5 x 7 1/2”. The fabrics are shades of blue. The items pictured in the pocket are not included in your purchase. Shipping is included in the price.